Meet Ann Wangui, a shopkeeper from the Rift Valley city of Nakuru, Kenya. Her second-hand suit business enjoys healthy margins thanks to low operating costs and high demand. From her kiosk at the heart of Nakuru’s municipal market, Ann sells at least 80 suits per month and diligently saves a portion of each sale for future investments in her business and family. As noted below, Zidisha has helped grow Ms. Wangui’s store and support her young children as they climb the ranks of secondary education. Last week, Vivien Barbier, Zidisha client relationship intern in Kenya, paid a visit to Ms. Wangui in downtown Nakuru. Take a look! My name is Vivien Barbier and I’m a client relationship interns for Zidisha in Kenya. Today I visited Mrs Ann Wangui and her husband in their boutique. 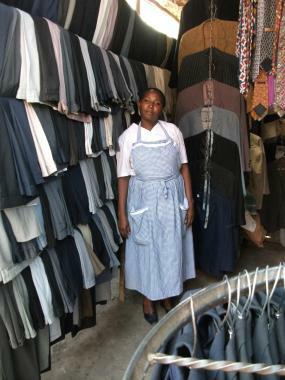 Mrs Wangui is running a shop in Nakuru’s market that sells second hand men suits. Every suit is in a very good state so it is hard to see that there are second hand. Before joining Zidisha, Mrs Wangui was client of other organizations that provided loans, but the interest rates were to high for her to make enough profit to grow the business. In addition to repay the debt, Mrs Wangui has to pay for the schools fees of her three children. Two of them are in high school and her youngest son is still at primary school. She told me that thanks to Zidisha and the low interest rate loan, the business is now much more profitable. Mrs Wangui also expects that her older son will be accepted to the university. In this case, the government will pay for his education. Mrs Wangui and her husband are putting a lot of effort to ensure the success of their children. The last few months have been a rough time for their family, Mrs Wangui sister get very sick. Mrs Wangui had to pay for the important medical fees; this prevented her to pay back the loan during a few months. Fortunately, things are better now, her sister is doing well and Mrs Wangui can focus again on running her business. She also explained me that during the last month, the business was not great in the whole region. July and August are usually bad months for business and things improve in September. This is not the first time I hear that in the area; the other day, a farmer explained me that this was because the harvest period that only starts in September. Mrs Wangui plans for the future is to buy at least one new full suit to expend her product line. With second hand suits it is impossible to have a pants and a jacket from the same fabric and color. New suits can be sold for 30 000 KES ($350) so the profit that she can expect will be much bigger than for second hand suits. I lost the count of the number of time she said “Thank you” to the Zidisha community for having helped her when she needed it. She also told me that I should come back next year to visit her shop again and that I will be amazed by the change that I will see then. Learn more about Ann Wangui’s story here! Yesterday I had the pleasure of meeting Mme Sarr at her house in the neighborhood of Parcelles Assainies, about an hour away from Central Dakar. Mme Sarr lives with her mother, her two sons and her daughter, as well as two brothers and their respective wifes and children. Mme Sarr is very proud to be one of the first Zidisha borrowers in Senegal. Since her workshop was demolished she has been working from home. Mme Sarr employs a tailor, Mr. Maguette Olle Ndoye, who does most of the sowing. 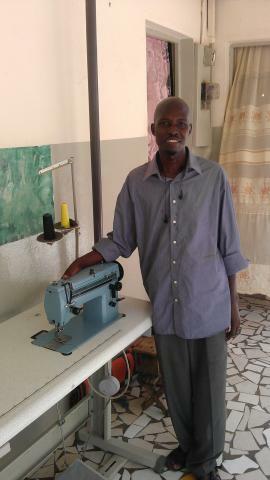 Mr. Ndoye is pictured smiling next to Mme Sarr’s new sowing machine. Mme Sarr used part of her most recent loan to buy her new Singer 2OU33 sowing machine, which she uses to produce traditional Senegalese dresses, or boubous, using a technique called ‘Pakistani embroidery’, which yields higher quality products. Clients now come to her house to admire her boubous and place orders. Two of her nieces were very eager to be photographed wearing them; their pictures are included below. 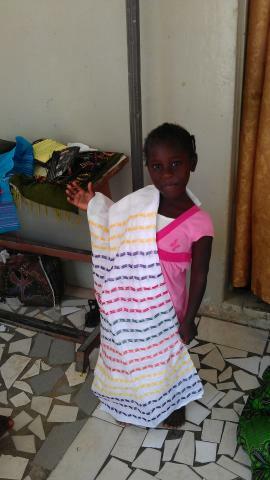 Mme Sarr has also started to make ‘ecosacs’ for a local NGO which is planning to commercialize them. Ecosacs are devices made of polyester and tissue that are used to save gaz. A pot with boiling water and rice can be taken out of the fire and put inside the ecosac where the food will continue to cook until it’s done. When the ecosac is closed tightly around the pot, it keeps the heat in. Mme Sarr is provided the materials, and earns 8,000 FCFA (16$) for each completed ecosac. She’s made some 70 of them over the past two months and she is hoping for bigger orders. In the future, Mme Sarr hopes to be able to buy the equipment necessary to produce using more techniques, including ‘petit fil’ and ‘gros fil’. She would like a big workshop downtown, with many employees, from which to produce and market her attractive boubous.